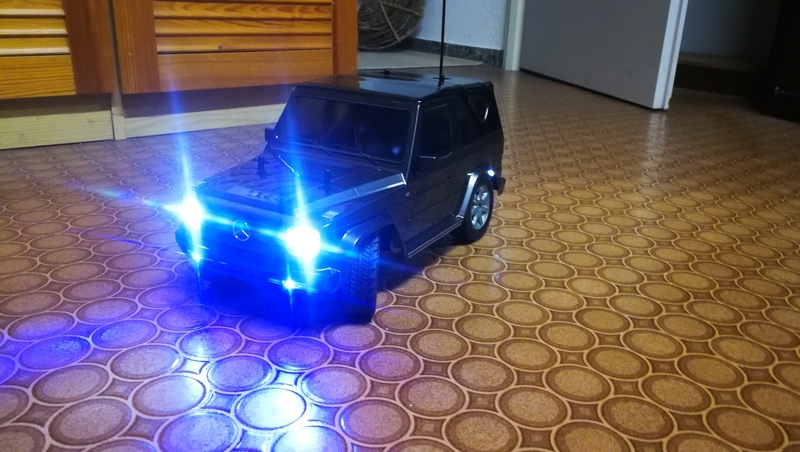 My goal was to equip my Mercedes SUV with headlights, front fog lights, and tail lights that could all be switched on and off using a spare channel on my remote. 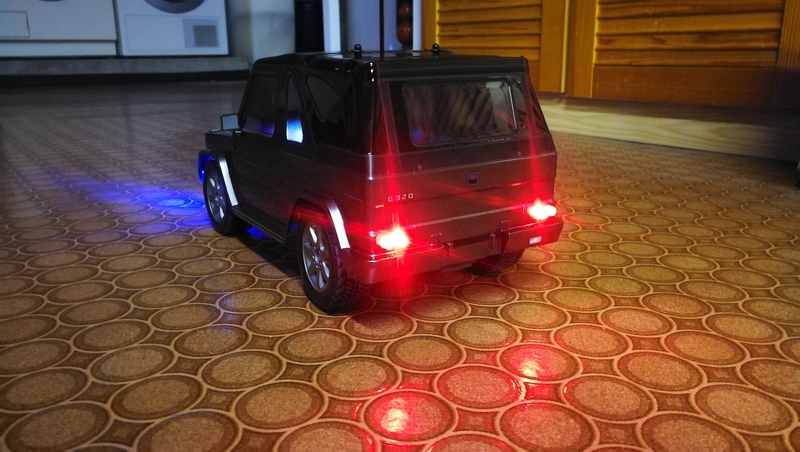 I also wanted to equip brake lights that would light up automatically while braking or reversing. 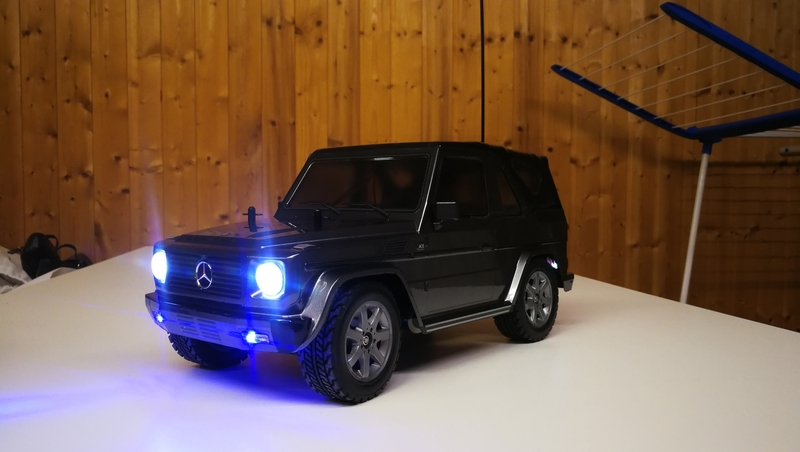 Before jumping into the lighting project, let’s first talk about the G320 kit from Tamiya. The vehicle is based on the MF-01X chassis, a rather simple SUV chassis with four-wheel drive. As usual, assembling the gearbox and the two differentials takes the most time (apart from cutting and coloring the body and applying the stickers). 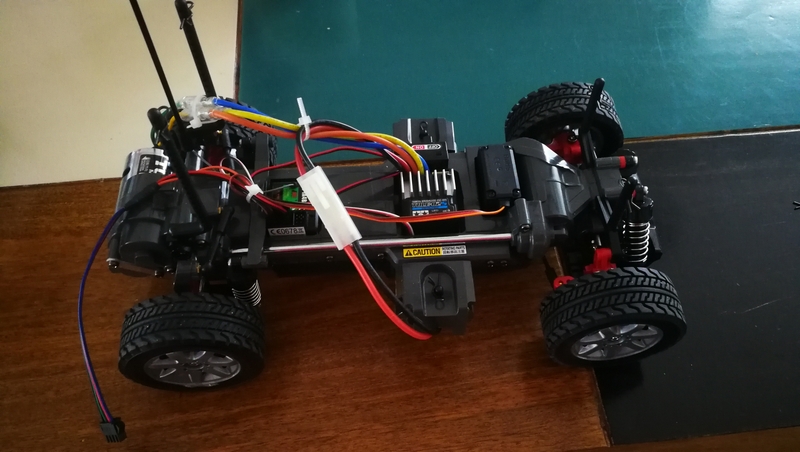 After about 4 hours I finished assembling the chassis, installed all electrical components (engine, servo, receiver, speed controller, battery), and made a quick test drive. As usual with Tamiya, the kit is of solid quality and can be assembled with little experience in building model cars. There are a lot of tuning parts for the MF-01X chassis available. In particular, I would recommend a ball bearing set (to replace the plastic bearings) and oil dampers. Spraying the body and especially cutting out and applying the 70 or so stickers was quite time consuming and cost me another few hours of work. Before spraying the body I drilled the holes for the lights. I used a traditional black Lexan paint spray for the top. For the rest I used Tamiya 85038 Spray TS-38 Gun Metal. I would recommend that you darken the inside of the windows with Tamiya 86031 Spray PS-31 Smoke, so that you cannot see the many cables from the outside. Next up was the lighting system. I would like to say in advance that I am not an electronics engineer, and this was also my very first Arduino project. Any potential for optimization and improvements of my approach are therefore reserved. It is a 4-channel remote control with comprehensive programming options. 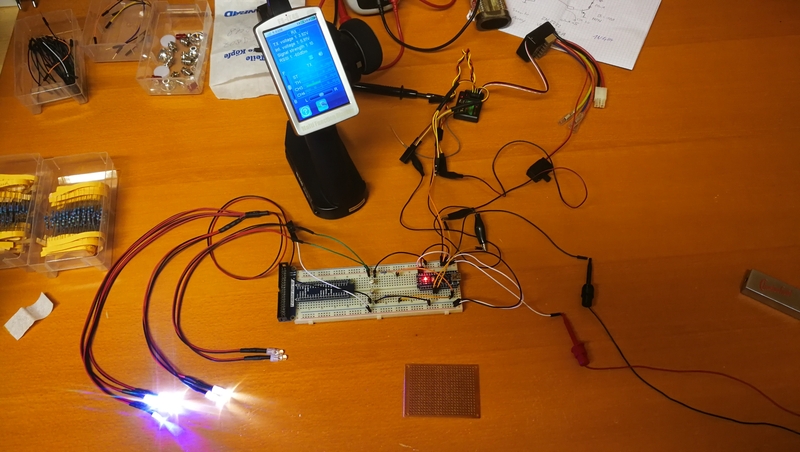 It was delivered with several sensors, which I did not use for this project. My goal is to be able to switch on the lights (headlights, front fog lights, and tail lights) with channel 3 of the remote control, and with channel 4 the brake lights. Later on I would use the programming possibilities of the remote control to program channel 4 in such a way that it always deflects in the opposite direction to channel 2 (throttle). My remote control uses pulse width modulation (PWM) for signal transmission. Since I was not familiar with this technology, I did some online research and came across a blog post by Nick Poole (thanks, Nick! ), that helped me to read the signals of my remote control on the receiver. The pulse signal on the individual channels is 1 millisecond at zero position, 1.5 milliseconds at neutral position, and 2 milliseconds at maximum position. Taking 0.1ms tolerance into account, I decided to switch the lights on or off if the signal goes over or below 1.6ms. 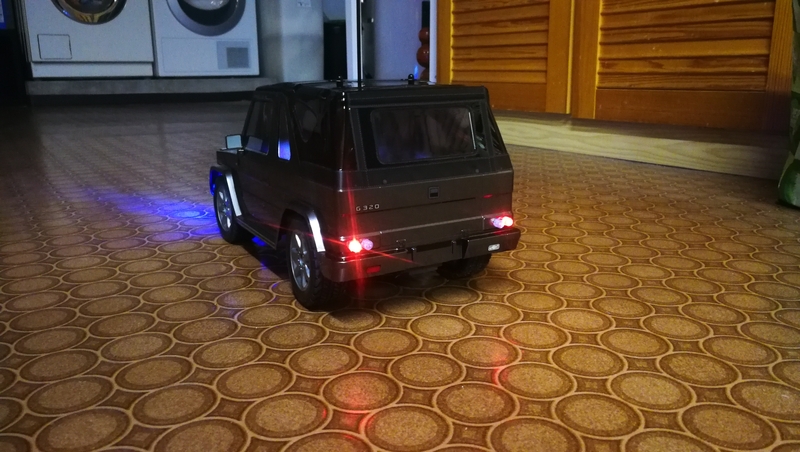 I used the 6-LEDs strip as is for headlights, fog lights, and tail lights. I cut off the two 3mm LEDs from the 4-LED strip, and used the remaining two bright white LEDs with a red housing cap as brake lights. I am using an Arduino Nano V3 compatible clone as my microcontroller, which I purchased from one of the many sellers on AliExpress for 2-3 US$. 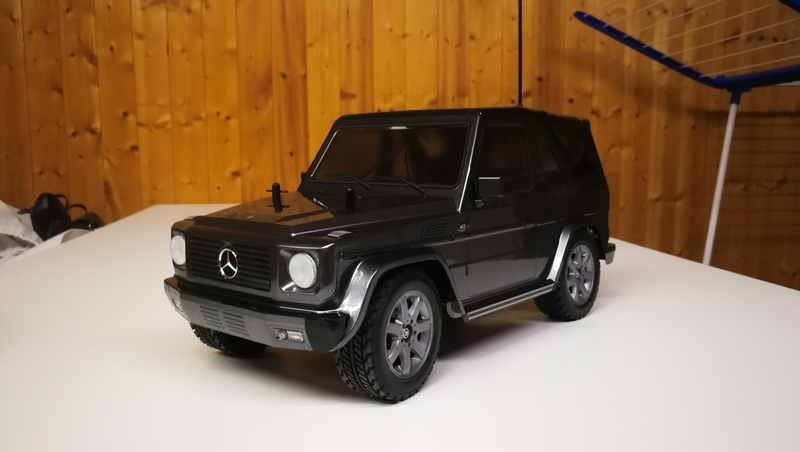 The Tamiya G320 kit runs with a 7.2V NiMH battery connected to the electronic speed controller that is included in the box. It delivers 6V DC to the receiver. 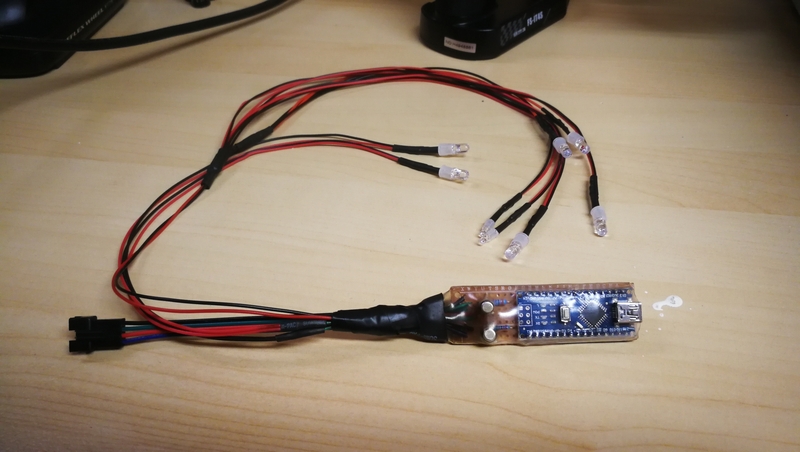 I did not dare to connect the receiver VCC directly to the 5V connector of the Arduino Nano. Also I had no voltage regulator with only 1V dropout at hand, so I tried to operate connect the receiver VCC to the VIN connector of the Arduino Nano (which is actually designed for 7V or more), which worked without problems. This is probably one aspect of the overall solution that could be improved. I used 2N2222 transistors to switch the LEDs. You can use cheaper options, but might want to chose the right pull-up resistor for the base. Connect the black wire (minus) of the first LED strip the collector of one resistor, and the red wire (plus) to VCC. Do the same with the second LED strip and transistor. Connect the emitters of both transistors to GND. Next, we want to make sure that the brake lights light up automatically when the brake is applied. This can be achieved by configuring channel 4 of the remote control depending on channel 2 (throttle), so that channel 4 becomes positive when channel 2 becomes negative. The following picture illustrate the setting to be made in the”Mix” menu of the remote control. Test your configuration by applying the brake. The brake lights should light up as long as the brake is active. After I had confirmation that my circuit worked, I soldered the individual components together on a board. I removed the upper PINs of the Arduino Nano. 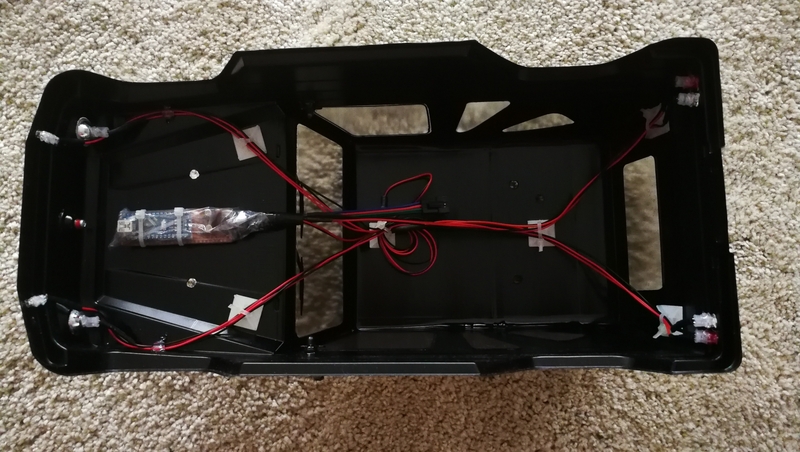 I also used a 5-pin connector to connect the body, to which the lights are later attached, to the chassis on which the receiver is located. I used a shrink tube to protect everything. After this last step nothing more stood in the way of trying it out. My work of several hours was duly rewarded. Do you have a similar project? Please tell me about it! We did not talk about schmitt triggers yet. When applying a Pulse width of roughly 1.6ms you might encounter a flickering of your brake lights. That is because your on- and off-threshold have the same value of 1.6ms. Thanks Raphael for your valuable input. I update the code to implement a schmitt trigger.